Non shrink tubing is used for electrical insulating, harness jacketing, fluid transfer and a variety of other applications. PVC tubing is the most common and is available in various operating temperatures and durometers. TFE and FEP Teflon tubing is typically used for high temperature applications or when exposed to harsh chemicals. Fiberglass sleeving and coated fiberglass sleeving is made in different dielectric grades for electrical insulating applications. The dielectric grades are 1500V, 2500V, 4000V and 7000V. The temperature class is determined by the coating; silicone, acrylic or vinyl. 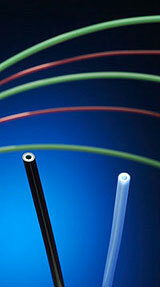 Extruded PVC tubing is the most economical insulation/jacketing for wire harness applications. 105°C PVC is UL VW-1 rated and meets Mil-I-631. General purpose and automotive grades are the least expensive but are only rated at a maximum of 90°C and are not UL. Mil-I-7444 PVC is a soft material with a low durometer for very low temperature applications. TFE teflon is widely used for very high temperature requirements. It is rated to 260°C and is also excellent for chemical resistance. FEP teflon is also available as an extruded tubing product with an operating temperature to 204°C. Braided fiberglass sleeving is available in a variety of coatings and grades to meet different temperature and electrical requirements. The coating thickness determines the grade and dielectric strength. The type of coating determines the temperature class and is available in Vinyl (130°C), Acrylic (155°C) and Silicone (200°C). Uncoated sleeving and saturated sleeving are also available for higher temperature applications. 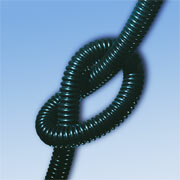 Braided polyester sleeving made from PET monofilament and used in applications requiring abrasion and cut-through resistance. Available in a 125°C standard polyester, flame retardant polyester, nylon, halar and combination braids. Plastic corrugated conduit is available as either slit or non-slit versions in polyethylene, FR polyethylene, polypropylene and nylon. It is used to provide protection for wire harnesses in the automotive/truck/RV/bus industry in addition to computer/electronics, telecommunications and specialty markets.